Nov. 14, 2018 | 9 a.m. Chances are that Wisconsin's number one fruit crop will make an appearance on your table this Thanksgiving. The American, or large-fruited, cranberry, Vaccinium macrocarpon, has been a holiday staple since the first Thanksgiving meal in 1621 (a true story, according to historians). Today Americans consume nearly 400 million pounds of cranberries per year — 2.3 pounds per person — almost entirely in the form of juice or juice blends. According to the Wisconsin State Cranberry Growers Association, the cranberry industry provides nearly $1 billion in annual revenue for Wisconsin, which produces over half the world's supply of this tart and tiny fruit. Around 250 farms in Wisconsin grow cranberries on 21,000 acres, mainly in the Central Sands region of the state, and the cranberry industry overall provides 4,000 jobs. One of three commercially developed fruit crops native to North America — blueberry and Concord grape are the others — the cranberry has been commercially cultivated in Wisconsin since 1860. But our history with Wisconsin's official state fruit predates European settlement in the region. According to the American Phytopathological Society, wild cranberries were a reliable food source for Native American peoples who also incorporated cranberry pulp into a poultice for treating wounds and used the juice as a dye for blankets and rugs. French-Canadian voyageurs learned from Native Americans how to make pemmican, essentially an early version of a power bar made of dried cranberries combined with fat and game meat that could last for months. Native Americans passed along their traditional knowledge about cranberries as an extraordinarily healthy food. High in fiber and vitamins A, C and K, cranberries are also cholesterol- and fat-free. In addition, they have very high levels of antioxidants, compounds that help prevent cellular deterioration, and phytochemicals known as a proanthocyanidins that inhibit bacteria. Part of what gives cranberries their unique properties is the relatively acidic soil in which they grow. According to Matt Lippert, agricultural agent for UW-Extension Wood County, cranberries need abundant water and low pH soils to grow well. Areas of glacial retreat in central and northern Wisconsin present especially ideal growing conditions. Monroe County, near Warrens, holds the highest concentration of cranberry farms, but there are plenty of other farms in Wood County (especially between Wisconsin Rapids and Babcock), as well as the northern counties of Vilas, Oneida and Price. The town of Warrens in Monroe County, where these cranberries are being harvested, is the epicenter of cranberry production in Wisconsin. Every year the town celebrates the fall harvest with the Warrens Cranberry Festival, the largest cranberry-related arts and crafts festival in the United States. Thanks to the familiar commercials made by Ocean Spray, which pretty much dominates the American market, many of us have a mental image of a waders-clad farmer, waist-deep in the cranberry marsh. But this marshy image represents only a brief moment of the cranberry's growth and harvest cycle. Instead of growing in water, cranberry plants flourish in dry marshes composed of alternating layers of sand and organic matter (usually peat). A perennial vine, cranberries take three years to establish and start bearing fruit. UW-Extension's Lippert noted that, left alone, unharvested cranberry plants put down additional roots along the stem, creating a new plant exactly like their parent plant in a process called clonal reproduction. Lippert said that most farmers propagate the plants by mowing a bed of vines and placing the cuttings on an open bed of pure sand. The cuttings are raked so that the tips are pushed into the sand and then watered. An entire bed of identical plants can be produced from the cuttings of an old bed. When the plants are firmly established through a fine yet shallow root system about six inches deep, they create a thick mat of interwoven vines. Some vines become runners that expand the surface area of the plant. Others grow upward, forming small, pink blossoms that bear a striking resemblance to the head and neck of a sandhill crane, which is why the early Dutch and German settlers took to calling the fruit craneberries. The work of growing cranberries begins in the spring, between April and May, when farmers use floodwaters to control the early stages of some insect pests and remove old leaf debris. Because frost occurs more frequently in the low-lying areas where cranberries grow, flooding, along with overhead irrigation, is also used to protect against frost damage to the soon-to-open flower buds. Produced by the plant near the end of the prior growing season, terminal buds that survive an entire Wisconsin winter open around the middle of June. In a single field are millions of flowers that need to be pollinated. So farmers introduce honeybee and bumblebee colonies to take on the work of pollinating the pink blossoms that by late July have transformed into immature, green fruits. As September rolls around and the nights become cooler, the fruit turns from green to red. October and November are when we see farmers in waders sloshing through marshes that are flooded to allow easier harvesting of the berries. 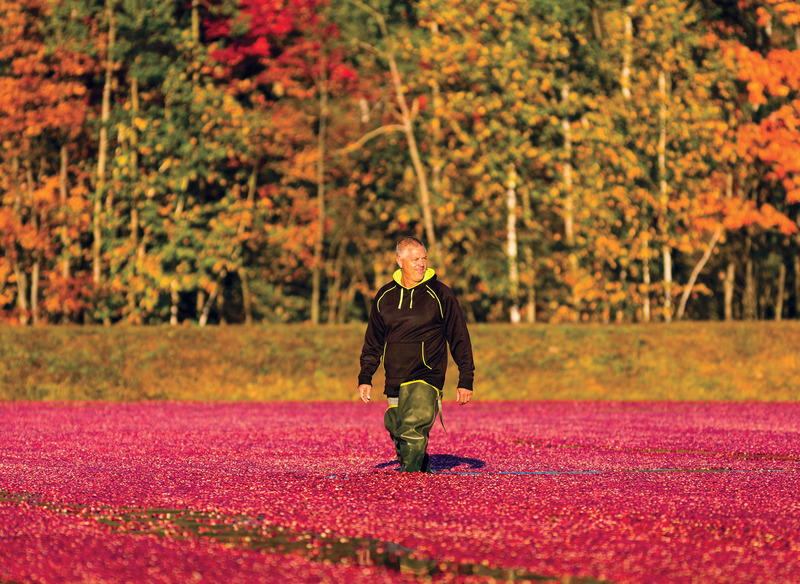 Jim Bible of Brockway Cranberry in Black River Falls wades through a flooded cranberry marsh as berries are about to be gathered. 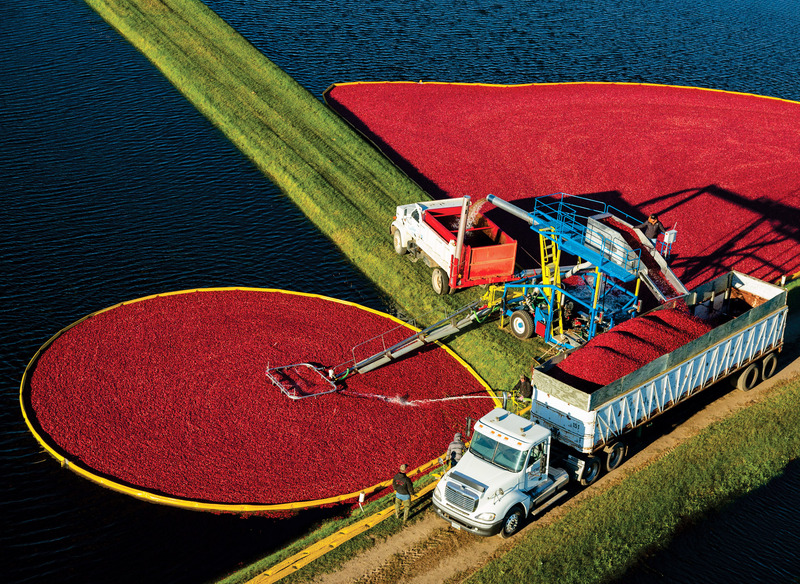 Because the cranberry has four interior air chambers, known as locules, it floats, making marsh-flooding the most efficient method for harvesting the fruit. Historically, cranberries were taken by dry harvest, using hand rakes attached to a capture bucket at the base. According to Lippert, this method does create a berry that will stay stable for a longer period of time. But, because these days only 5 percent of the fruit is used fresh, water is used for almost all harvesting. There is a slight difference between the way cranberries destined to be used fresh and those meant to be processed are harvested. To gather fresh cranberries, a picking machine with small tines gently combs through plants submerged in four to six inches of water. The berries are gently moved by conveyor belt to drying boxes with slatted bottoms, to be stored in heavily insulated or mechanically refrigerated buildings until sorted and packaged for retail sale. The other 95 percent of the berries, destined for processing into juice, sauce, or sweetened dried cranberries, are harvested in eight to ten inches of water using a harrow, a small machine with a circular wheel that slowly paddles through the bed, gently knocking berries off the vines. This is the point when the farmers put on their waders, get in the water, and corral the floating berries to the edge of the marsh, where they will be pumped out. These berries are then delivered to a receiving station where they are graded, cleaned, and frozen for future use. After the last of the cranberries are harvested by mid-November, the marshes are once again flooded with water; this time, enough to create a protective layer of ice about a foot above the submerged vines. Another pre-winter preparation that growers take on about every three years is adding about a quarter inch of sand to the bed, which filters down to the vines with the ice thaw in spring to provide new rooting capacity for existing vines. While most commercial cranberry plants have an average lifespan of anywhere from ten to fifty years, it is not unheard of for plants to last as long as a hundred years. 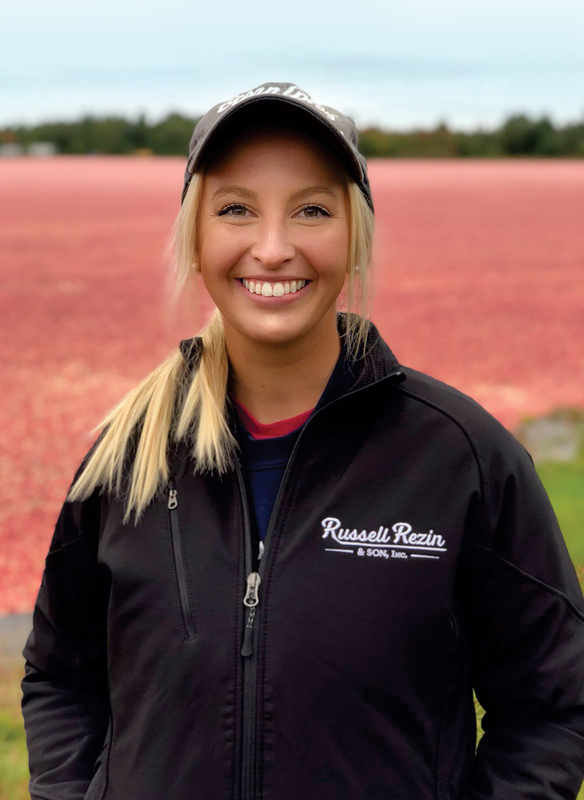 They don’t have any hundred-year-old plants at Russell Rezin & Son, according to Amber Schultz, though her family has been growing cranberries on a 230-acre marsh in Warrens since 1918. 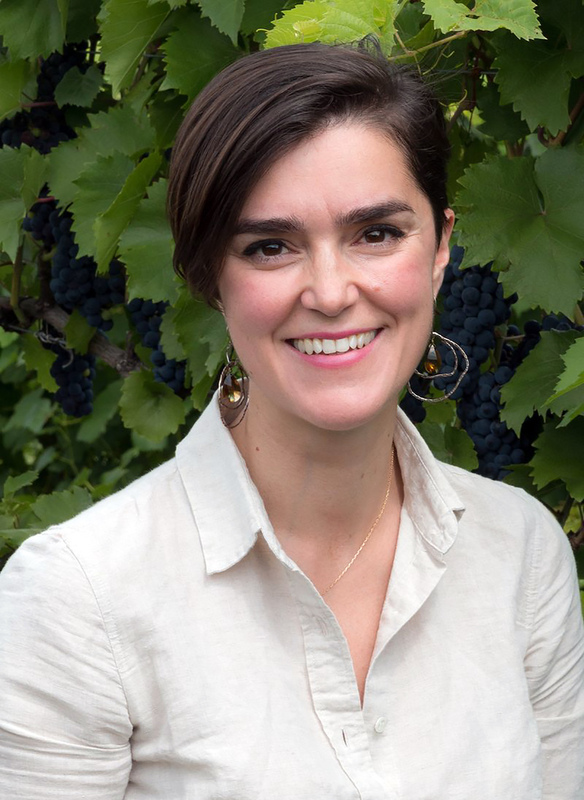 At 26 years old, Schultz represents the fifth generation of growers in her family. For Amber Schultz and her family, there is no sweeter fruit than the cranberry. She says she loves this land and is proud of her work. Schultz has been surrounded by cranberries for as long as she can remember. As a child she would ride along with her dad to check on frost conditions, and help out with harvest when she could. She did leave for a period of time to attend college in La Crosse and worked at a few different jobs. But Schultz had an epiphany that the cranberry farm was the place she would finally call home. Schultz says that being a cranberry farmer and establishing a productive marsh is not for everyone, a sentiment reflected by Amaya Atucha, a fruit crop specialist in the Horticulture Department at the University of Wisconsin-Madison who studies cranberry vine physiology and how the plants cope with environmental stresses. "I've never heard of anyone ever calling me because they want to start a cranberry marsh," said Atucha, pointing out that, like Schultz, most growers today come from multi-generational farms and that establishing a new marsh is very expensive. According to Atucha, pest and disease management are two big challenges for cranberry growers. While certain pests are very well understood, and growers know how to target them using integrated pest management and other low-pesticide methods, climate change is affecting current and new pest populations. "Some insects that weren't considered pests, are now appearing in higher numbers or earlier in the season, which in some cases can result in production loss," she said. "Climate change has also affected temperature and precipitation patterns, which can impact the growth and viability of plants while driving populations of invasive weeds." Amaya Atucha studies emerging challenges to cranberry farms, including how climate change is affecting the presence of pests. Atucha said that "cranberry growers are very conscious about pesticide and fertilizer use because their production systems require the use of water more than other crops." Every cranberry grower in Wisconsin must secure an approved (by Atucha or another certified crop consultant) nutrient management plan that confirms the fertilizers they are applying match the needs of the crop. Growers use their own yield records and the results from plant tissue analysis by labs such as the UW Soil and Forage LAB in Marshfield to design the fertility plan for the following year. To help growers address nutrient deficiencies or excesses, UW-Madison researchers and agencies such as the USDA Natural Resources Conservation Service and the state of Wisconsin's Department of Agriculture, Trade and Consumer Protection have developed a certification program to help growers develop successful nutrient management plans for their marshes. Atucha underscored how the regular review of best practices and constant monitoring of chemical inputs by cranberry growers isn't typical of all crop growers in Wisconsin. "I really wish others would be doing this," she said, adding that cranberry growers are also working hard to better inform consumers about the practices involved in cranberry production. By working with state agencies, the Wisconsin State Cranberry Growers Association, and fruit crop experts such as Amaya Atucha and others at UW-Madison, Wisconsin cranberry growers will likely weather a recent glut in inventory and changes to export tariff guidelines that have contributed to a decline in prices. But there are other reasons that the cranberry is here to stay in Wisconsin. For Amber Schultz and her family, there is no sweeter fruit. She said she loves this land and is proud of her work. "Cranberry growing is in my blood," she said. "This is what I need to be doing. I wouldn't trade anything for what we have out here." Editor's note: This article was originally published in the fall 2018 issue of Wisconsin People & Ideas, and is copyrighted to the Wisconsin Academy of Sciences, Arts & Letters.